Chris Diehl and I presented a pair of presentations at the WP Philly meetup this evening on the new Gutenberg editor. Here are my slides; you may also find them on SlideShare. Edited to add: Updated one of the slides and reuploaded presentation. So, I was at the WordCamp US party for speakers, sponsors and volunteers, and three times over the course of this evening I was introduced as the woman who was the Blue Screen of Death at WordCamp Philly in October. 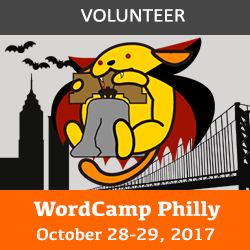 One of the things I’ve been up to the past year is serving as one of 10 co-organizers of WordCamp Philly 2017, which was October 28 and 29 at the University of the Sciences. We’re winding down for 2017 and looking ahead to next year. To get started, we’re again offering an opportunity for members of the WordPress community to join the organizing team. If you’d like to be a WordCamp Philly 2018 co-organizer, apply online before January 1. Along with the application you’ll find information about what to expect in terms of time and activities. You don’t need to be a WordPress expert to get involved in planning a WordCamp. Communication, design, organizational and people skills are just a few of the assets that are more important than knowing code when it comes to planning an event. The slides from my presentation to WP Philly this evening are posted. The fonts and animations enjoyed various adventures in the transition from Keynote through PowerPoint to SlideShare, but the content appears to have arrived at its final destination more or less intact. You can also see them on SlideShare. When I test plugins for work, I keep notes on which ones I’ve tried out and what I found. After five years and more than 300 plugins I can’t always remember which ones I’ve looked at and when.